Blog Is your Muslim spouse happy? Happiness is something that is fleeting. You have it for a while and then it goes away, only to return in equal measure the next moment. Such is the nature of this world which is not perfect. So in the books of Allah, happiness is more about us being content with our lives. In Muslim marriage too, Allah tells us the same about the relationship. For us to live in love and harmony, and patience and compromise. Allah does not expect perfection form our marriage rather contentment from it. So are you making your marriage one in which you and your spouse are content (read: happy)? Are you giving all that you are capable of in this immensely important relationship? Are you making an effort? There are lots of ways to ensure that your spouse is happy with their marriage and you must analyze the different aspects of the relationship you share to ensure such is the case. Spending time together is the one of the prime ways to ensure your spouse is happy. Yes, a husband and wife have different roles in the household and making time can be difficult but work on it. Make sure you spend time with your spouse and make it a top priority. Show that you understand their feelings. Infact tell them that. Speak out the words “I understand what you feel and I am there for you.” More often than not, your spouse will show signs of contentment when you do that. Love your spouse for the sake of Allah. Analyze why you married them in the first place. It should have been their closeness to Allah. If your spouse continues to pray, fast, and have faith in Allah then you have nothing to fear. Happiness and contentment will come automatically. When you and your spouse pray together, read Quran together, read tahajjud together and fast together, Allah will bless your marriage and bring calm and happiness in it Himself. THAT is the reward your marriage will receive if you and your spouse are close to Allah. What more can you ask for? Another way to judge that your spouse is happy in their marriage is if you are grateful to them. And they are grateful to you. Just like we thank Allah for all our blessings, we must also be grateful for all that our spouse does for us. Happiness is also friendship. If your spouse is your best friend, half the lack of communication disappears. Because you find yourself discussing your household problems with them as a friend would. So analyze your relationship. 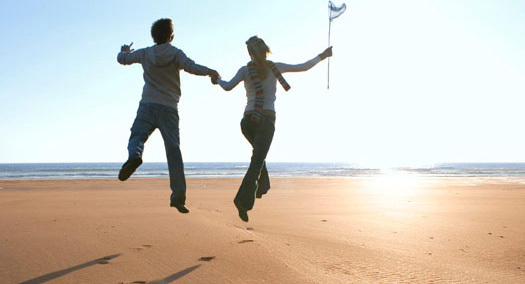 Are you happy in your marriage and is your spouse happy? Are you the best of friends? Do you respect each other? And then work on the shortcomings. Your marriage may not be a perfect one (yes, no one’s marriage is!) but it could be a happy content one. Let’s make it that.